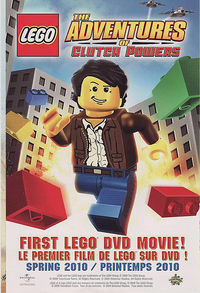 2854298 LEGO: The Adventures of Clutch Powers is a CGI direct-to-DVD movie released in the Spring of 2010. This was the first ever LEGO movie known. The movie incorporates a diverse range of existing LEGO themes into a single plotline, including Mars Mission, Space Police III, City, Power Miners, Castle (2007), and Agents. It was developed by Tinseltown Toons and was published by Universal Studios. The trailer for the movie was first shown on the 2853367 BIONICLE: The Legend Reborn DVD. The movie begins with Clutch Powers, the most famous LEGO explorer, trying to retrieve an energy crystal from an underground cave. He finds the crystal, but spots a larger energy crystal in the cave as well. Clutch pulls out the crystal, which awakens an orange Crystal King, and he is chased through the cave. Just as he is about to escape, the Crystal King blocks the exit with a boulder. Clutch then wrestles the King using the Mine Mech but is thrown out of the Mech, and after that, he spots a pile of LEGO bricks. He visualises what he could build: either a racecar, a jet, or a slingshot. He decides to make a slingshot and gets working. Meanwhile, the Crystal King realizes that Clutch is not in the Mine Mech anymore, so he continues to chase him but knocks over a tower and gets pinned. Clutch finishes the slingshot and launches himself at the boulder. Just as he is about to escape, the crystal reveals itself to be a Rock Monster baby. He puts a stud pacifier in the baby's mouth then builds a stroller for it. Clutch returns the baby and apologizes, and is rewarded with an orange energy crystal. After this, he drives his Agents car back to the LEGO building in LEGO City. On the way there we learn just how popular Clutch is, and they don't seem to mind when he nearly destroys a construction site on the way there. When he arrives, he is introduced to a team of three (Brick Masterson, Peg Mooring, and Bernie Von Beam) by his boss Kjeld Playwell that will help him in his next assignment: investigate a recent prison break on the Space Police prison planet X4. They are introduced to Arthur Fol who swears to be Clutch Power's "number one fan", shows them the spaceship he has built for them. He shows them the miniature model (it has a spinner). Then, when Brick asks how are they going to fit in, Artie shows them the real life version. The group travels to the prison planet in Mars Mission outfits. Bernie suggests that he should guard the spaceship, but Clutch refuses. They can't open the door, so Clutch builds a giant key to open it (Brick says that this is the first time anyone has to break into a prison). Then, while analyzing the base, Brick burps, and Clutch tells him to keep an eye out behind them. One of the prisoners, the evil wizard Mallock the Malign, attacks them and then leaves in their ship. They meet the Space Police watch commander that has sent Kjeld a garbled distress call earlier who explains to them that Mallock plans to harness all the forces of evil together and steal the deceased King Revet's powerful golden sword, now in the hands of Prince Varen. They make a new ship, with a failed first attempt. After a tip from Kjeld Playwell, the group travels to another planet, Ashlar, that is in the setting of the Castle (2007) story line. Brick tries to parallel park the ship, but knocks over Legohenge, a play on Stonehenge, in the process, which upsets Bernie. Clutch looks for the prince and the rest tries to build a battle cart at an old abandoned mine (they meet Lofar the Dwarf who has assumed they're villains, but calms down once Peg tells him they are here to defeat Mallock). Peg finds a dragon and gets burned by its sneeze while Brick and Bernie work on the cart. Clutch encounters Hogar the Troll, who challenges him to three tests that will allow him to cross a bridge, while Mallock tells Skelly and Bones to find Clutch, who will lead them to the prince. After finishing the three tests, Skelly and Bones find Clutch but Hogar eats him, smacks the two skeletons and runs away (he spits Clutch out after entering the wall hiding the castle). He finds the prince, who refuses to help. So Clutch returns to his team, who have finished the cart and are about to attack Mallock's castle when the prince comes back and elects to help them, along with his army. Clutch and the prince sneak into the castle while Peg wears the prince's crown and leads the knights against an army of undead skeletons with a large battle that ensues. Clutch and the prince finish off an enchanted suit of armor, but are captured and hung in a cage by Mallock. The knights retreat, and Peg, Bernie, and Brick crash the cart, in which they start to argue. Mallock forces Hogar to give him the golden sword of King Revet, which Prince Varen brought to the Skeleton Tower. If he doesn't, Prince Varen and Clutch won't be seen again. Mallock thinks Hogar is tricking him when he discovers the chest is empty and throws him toward the wall. But Clutch and the prince, whose images are reflected into the night sky, send the team a message using bones: LEGO, which is translated by them as "Build on each other." So Bernie, kissed by Peg, rebuilds the cart into an off-road Jeep. Peg flies her dragon in and frees Clutch and the prince, while Brick flies in with a jet pack to finish off Mallock's skeleton guards, Skelly and Bones. Bernie helps Brick by throwing the leftover part (an orange gear) at the two skeletons. Another war ensues. Varen tells Clutch that he doesn't need to find his father, because his dad is with him in his heart. Then they face off against Mallock. The prince arrests Mallock and is crowned king, the skeleton army is destroyed, and the team returns to LEGO City, where they are assigned their next mission, to find another prisoner on the other side of the galaxy. The movie was shown on Disney XD on April 12, 2011. In it, the word "LEGO" is removed to avoid copyright issues. "Clutch Powers" is referenced in Ninjago masters of spinjitzu when Cole says that Clutch Powers is the one who found the Constrictai fangblade and started the Royal Blacksmiths. This is a description taken from LEGO.com. Please do not modify it. (visit this item's product page) Meet Clutch Powers the best builder in the LEGO® universe! Facts about "2854298 LEGO: The Adventures of Clutch Powers"
This page was last edited on 9 February 2019, at 17:07.